The Model 10 Mark II VSM is the state of the art in VSM magnetometers. Its sensitivity and accuracy surpasses all other commercial vector magnetometers. Its field range and resolution make it the ideal system both for high and low coercivity materials. 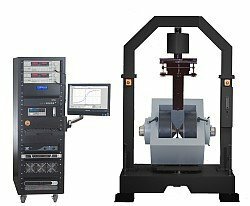 The accuracy in the determination of the magnetization vector, together with the high sensitivity, makes this the first VSM that can be a real alternative to a torque magnetometer for anisotropy studies on modern recording materials. The real time field control system with field noise as low as 5 mOe, make this system suitable for both high coercivity and low coercivity materials. The Model 10 VSM has solved the biggest problem in traditional vector magnetometers: the difficult calibration process and the angular dependence of the sensitivity. In a traditional VSM, when the orientation of the sample to the field (or the field to the sample) is changed, the orientation of the sample relative to the coils is changed. As a result, the sensitivity of the system will be different at every angle. This is especially true if the sample is not rotation symmetric. Even with rotation symmetric samples there will always be some angular variation due to rotation eccentricities. Furthermore, in all vector magnetometers where the sensor is fixed relative to the magnetic field, it is impossible to do a direct calibration of the Y direction sensor (coils) because it is impossible to apply a field in the Y direction and saturate the sample. Both issues have been solved in the Model 10 VSM Mark II. In this system the sensor coils are fixed relative to the sample and the magnet rotates around both the coils and the sample. This allows the direct calibration of the Y coils by applying a field in the direction of the Y coils and it prevents angular sensitivity changes in the sensitivity by keeping the position and orientation of the sample fixed to the sense coils. The Model 10 VSM delivers very low vector coil noise of 5 micro-emu without any signal averaging and 0.5 micro-emu when the signal is averaged 100 times. The magnet can rotate from -540 to + 540 degrees with a resolution better than 0.1 deg. The vector coils are a standard option. At the most optimal gap, the system can reach a maximum field of 20,000 Oe and has a maximum error in the magnetization vector magnitude or angle of less than ±1.5% and ±1.5º. At a slightly smaller magnet gap, the maximum field is 22,000 Oe. The temperature option is always included with the system and always ready to use installed on the system. The temperature range is 77K + 100K to 773K. The inside diameter of the temperature chamber (oven/cryostat) is 10 mm, considerably larger than the ID of other vector VSM systems ovens or cryostats. The combination of the 6x lower vector coil noise and the larger sample space provides the Model 10 with a 15x better signal to noise ratio than the closest competitor. A high field scalar option is available to bring the maximum field to above 30,000 Oe. The Model 10 VSM mk II is equipped with a 15 kW magnet power supply that can easily deliver the 10.6 kW required at maximum field by the electromagnet. Due to the high efficiency of the design of this power supply, very little power is dissipated inside the power supply, reducing the stress on all electronic components ensuring a long trouble free life of the power supply. Also, because so little power is dissipated in the power supply, no water cooling is required to cool the electronics, making this an inherently much safer design than power supplies that require water cooling. The automatic sample rotation option allows you to measure the sample at different angles relative to the magnetic field. The VSM software can automatically change the angle between -400 and + 400 deg with a resolution of 0.05º. You can program a sequence of measurements performed at different angles or you can do for example angle dependent remanence measurements etc. Temperature Control 3 different sample temperature control options are offered. All temperature options have in common that they are installed on a slide and mounted permanently on the measurement system. This allows you to simply slide the temperature option in place when it is needed or out of the way when you plan to do room temperature measurements. No cables or tubes need to be connected or disconnected when switching back and forth. Because of the small OD of the temperature chambers, the field homogeneity is always excellent and because of the low noise at the gap required for the temperature chambers, most users will rarely feel the need to adjust the magnet gap. This makes switching to and from a room temperature configuration very easy and quick when compared to competing systems. This option is the most commonly used temperature option in the EV systems. It offers a temperature range from 77K + 100K to 1000K without the need to switch hardware. The large ID of the temperature chamber allows for samples with a 2.5x larger surface area or volume than in most competing systems. This combined with a 2x lower system noise gives the EV VSMs with the EV1-LNA option 5x better Signal to Noise Ratio than most competing systems. This offers a temperature range from 4.2K + 6.5K to 450K without the need to switch hardware. When used with an optional liquid nitrogen Dewar this system can also be used with liquid nitrogen from 90K to 450K. The large 9 mm ID of the temperature chamber allows for samples with an almost 2 x larger surface area or volume than in most competing systems. This combined with a 3x lower system noise gives the EV VSMs with the EV1-LHE approximately 6x better Signal to Noise ratio compared to competing systems. The vector coil option allows the simultaneous measurements of the X and Y components of the magnetization vector. The minimum system noise with the vector option is below 1 µemu and the maximum field with the vector option is 30-40% higher than in competing systems. The vector coil option is fully compatible with the different temperature options. The standard measurement mode in the VSM uses field stepping; the field comes to a complete stop before a measurement point is taken. This gives the most accurate measurement of many of the magnetic parameters. Adding the Sweep field measurement option enables the system to measure data continuously while the field is being swept. This provides up to 60 data points per second, allowing for even faster measurement times and more data points per measurement. MicroSense offers true torque magnetometers both as an option to the EV VSM systems and as a standalone system (ET7, ET9 and ET11 systems). Unlike other measurement systems that strive to determine torque and anisotropy from vector VSM systems, the MicroSense Torque system actually measures the force (torque) on the magnetic sample and from that it accurately determines the Magnetic Anisotropy. Not only is this more accurate, it is also more than 10x more sensitive. Besides this the maximum field is approximately 60% higher than in competing vector coil based torque magnetometer. The magneto-resistance option provides for a 4 point probe for measuring the field, temperature and angle dependent behavior of the resistance of a sample. This option can be used together with the EV1-LNA option up to 400 °C and does not require the removal of the vector option (if that is installed).